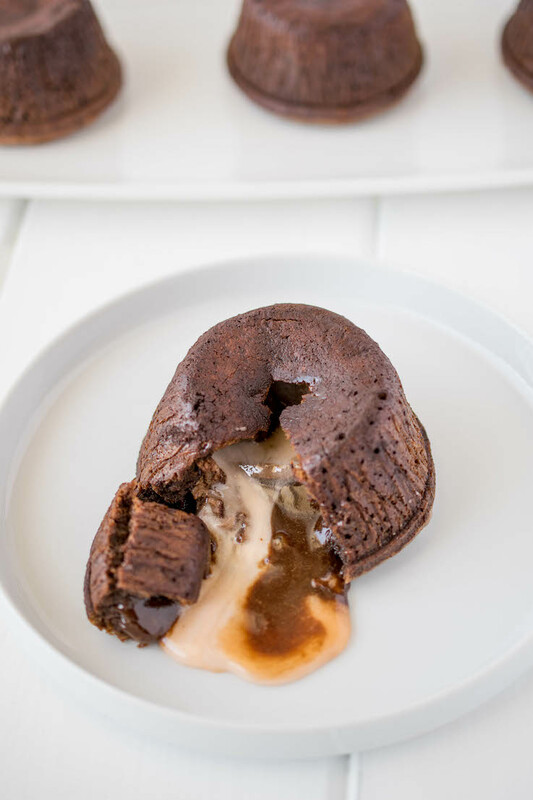 Cadbury Creme Egg Chocolate Lava Cakes are a chocolate lovers dream. Rich chocolate cake with a molten center of a cadbury cream egg. Your Easter dessert just took a left turn. That left turn is a good, nay a GREAT thing. 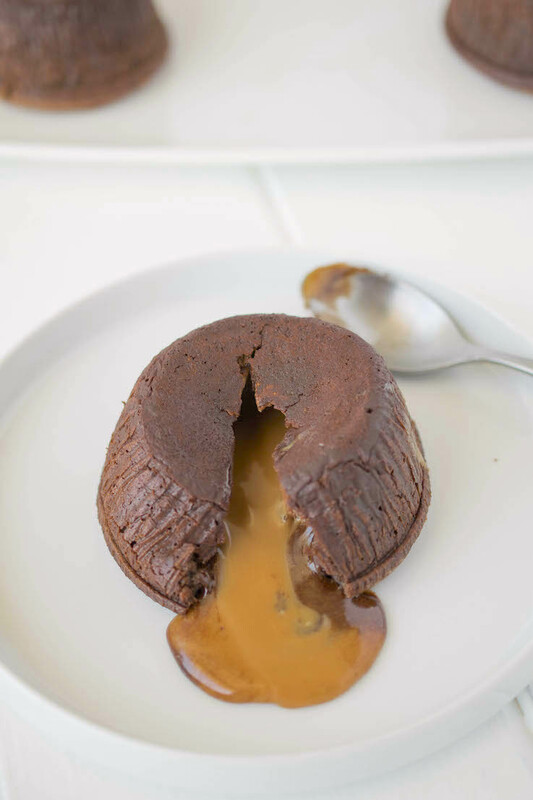 If you’re a fan of chocolate lava cakes, I took them up a level by adding an Easter twist on it and popped Cadbury creme egg in the center and baked them. That’s a warm molten creme egg! In the middle of a chocolate cake! I know! I’m excited too! (I’ll stop the exclamations). When I got to the store to buy the creme eggs, to my delight I see they now have caramel eggs in addition to the regular eggs. Where have I been? I clearly need to get out more. I bought both because chocolate and caramel are my 2 favorite dessert items. This could be your new family Easter dessert. With its impressive presentation, people will think they were made by a pastry chef. 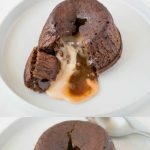 If you’ve tried these Cadbury Creme Egg Chocolate Lava Cakes or any other recipe on the blog, then don’t forget to rate the recipe and let me know it turned out in the comments below. I love to hear from my readers! You can also FOLLOW ME on FACEBOOK, TWITTER, INSTAGRAM and PINTEREST to see daily recipe updates. 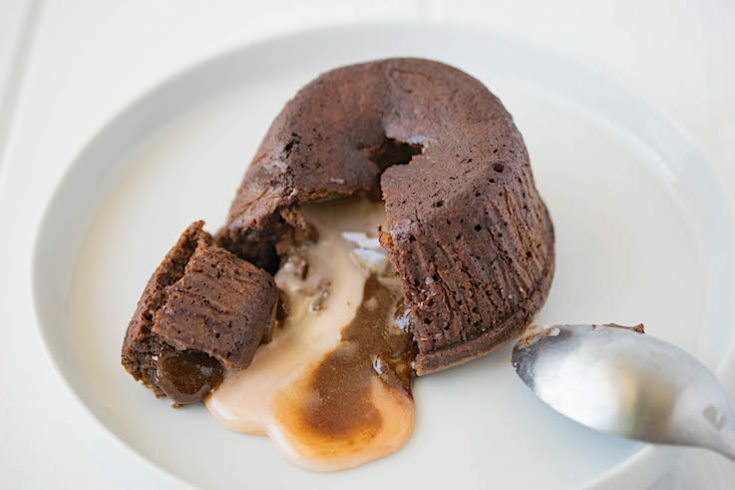 Cadbury creme egg chocolate lava cakes are a chocolate lovers dream. Rich chocolate cake with a molten center of a cadbury cream egg. Spray four 5 ounce ramekins with non-stick spray. Dust with cocoa powder and tap over the sink to discard any excess. Place them on a baking sheet and set aside. Fill a pan with water and heat until low simmer. Add the butter and chocolate to the bowl and stir until melted, turn off the heat. To a mixing bowl or stand mixer add the eggs, egg yolks and sugar. Beat on low speed for 1 minute then faster speed for 2 minutes until pale and fluffed. Pour the melted butter and chocolate slowly into the egg mix while whisking. Add the flour and in small batches, whisking in-between additions, until well combined. Stir in the espresso powder. Fill the molds half full and place a creme egg in the center. Fill the molds so they mix covers the eggs. Bake in the center of the oven for 10 minutes. Until the edges look cooked and the centers are sunken and look moist. See note. Remove from oven and allow to cool for 10 minutes. To remove from the mold, turn onto a serving plate and serve immediately. We just had this for dessert— oh my word!! Make it!! My nephew actually licked his plate!! So, straight from oven to table.. can you keep any of this ahead of time? Hi John, I haven’t tried it but I don’t see why you couldn’t make them right up to putting the mix in the molds then refrigerating until ready to bake. Thanks for stopping by. There is a chocolate fudge Cadbury egg too. I’ll have to try a cake with each of the eggs. Thanks for sharing the recipe. Hi Dave, thanks for stopping by. Yes, I really enjoyed it with both eggs. YUM! Thank you for linking to last week’s Tasty Tuesday linky party. I have pinned your recipe to Creative K Kid’s Tasty Tuesday Pinterest board. I hope that you’ll join us again this week with your new recipes. Wowzaa! Man, these look good! And your video of breaking into them and having those melted creme eggs spill out…. sign me up! Wow what a great idea! They look amazing and delicious. A chocoholic’s fantasy! Well done my friend! These just look redonkulously good, great idea!! Wow these are fun! So cute! So yummy! I’m really excited by the creativity in this recipe.